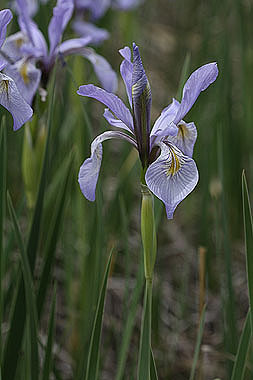 Wild Iris is found in meadows and along streamsides, often growing in colonies. Habitat is usually wet prior to flowering but can be quite dry during the rest of the year. 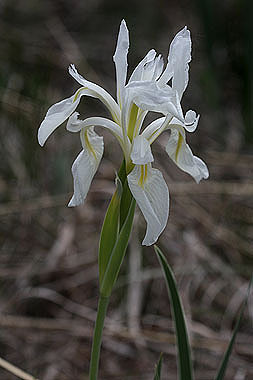 Purple flowers are most common, but white flowers are occasionally found. Flowers have six petal-like tepals. The outer three tepals are reflexed and have a yellow stripe. The inner whorl of tepals is erect. Plants spread via rhizomes, which contributes to their patchy growth habit.